Hot on the coast and cooler in the Andes. There is, like all countries in South America, lots to see. Lima itself was not so appealing to me and from all accounts a little dangerous. When picked up from the airport, the first thing my hostel driver did was lock the doors. When I gave a startled look it was explained to me a that at the traffic lights young men in groups with open the doors and try to either remove your bags or remove you from the vehicle and beat you up in order to obtain money, cameras, more or less everything you have with you. I only stayed in the city for a day and headed to Nazca. All the coast of Peru is desert but from the ancient aquaducts there is a fresh water supply from the Andes. Some of these water channels, which are mainly underground, are up to 1000km long. I went to where 3 of these channels came out in a huge well. Apart from the Nazca Lines which you view from the air, there are also pyramids and old burial grounds which are being excavated on the plains next to the Nazca plain. The wind here travels at 40km per hr all day, everyday. The puzzling thing is that the sand does not reach the Nazca Plain which is only separated by a dried up river ( until the rains and snow melts in the Andes ). The distance between the two plains is approx. ½ km. My guide, and no one else to date, has been able to explain this. Puno was the next jump up in altitude to 4000m above sea level. It is right on the edge of Lake Titicaca. From here you can do the floating reed islands. My feeling is that if it weren’t for the tourists visiting then they would no longer be living on the reed islands. Puno is very smelly if it rains, which it had to do when I first got there, and to make it worse I had altitude sickness. My friend Amy was fine. Coca tea – does it work- I don’t know. I have tried it a few times now and personally don’t think it does anything for me. 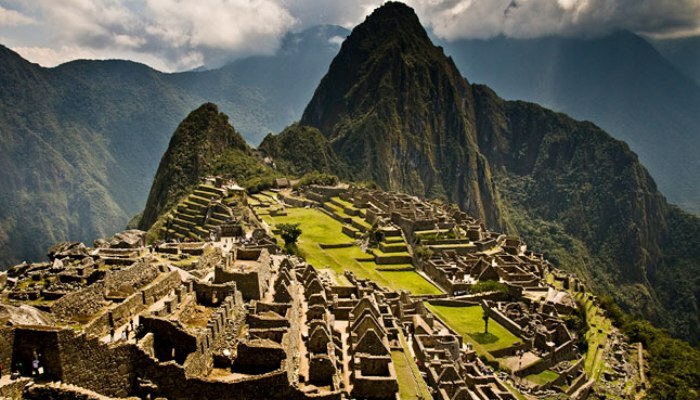 Cusco is where , obviously, everyone heads for to see Machu Picchu or to do the Inca Trail. I took the backpackers train and did the day trip. It’s a long day but so worth the effort. Kiwi’s note the Totara tree where the buses drop you off. Machu Picchu left me with more questions than answers. It is an amazing place. If you are fit you can climb Huayna Picchu. On average it will take an hour. Its hard slog though! 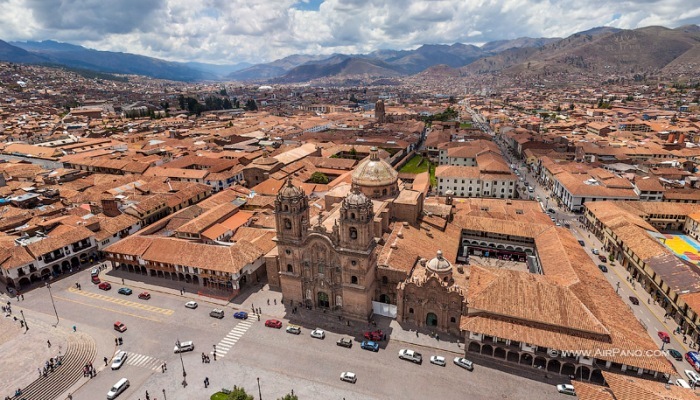 Cusco has lots to see and do. Amy and I did a bus tour of the surrounding villages and went to the temple of the sun in the sacred valley of Urubamba. This too is a mysterious place. You can stand in front of the sun temple and look down on this whole ancient site but when you put your head around the corner it nearly gets blown off. The wind whistles past here at 40kmph ( or there abouts ). It is like this day in and day out. How? Why? Who knows, just another of those unanswered questions that fascinates me. You don’t have to do a tour for the Nazca plains. Go to the airport and just go ask one of the pilots that will be standing by his plane. If you go in a group of up to 5 this is better. It is about a third of the price this way. Hostel and hotel owners will insist that you can’t do this, YOU CAN! In Peru they tend to load your bags onto the bus once everyone is on. In Nazca no-one got on the bus much to the driver’s annoyance. Stand your ground and make sure the bags are loaded before you hop on. Peru was the only country that I didn’t feel at ease about my luggage. Sit on the side of the bus that bags are loaded. This way you can watch at every stop to make sure no-one is taking off with your bag. It does happen every now and then, but luckily it’s not very common. Wear good footwear for Machu Picchu. Don’t forget your tourist stamp from Machu Picchu in your passport. Got mine! If you’re fit , Huayna Picchu is absolutely worth the hard slog. If you want to post a parcel home from Cusco take a photocopy of your passport with you. They provide boxes and tape. Try guinea pig and lama. Let’s face it, you probably won’t have the chance to again so go for it. It’s not bad actually! Don’t be out late in the wrong area of Lima. Sadly violence towards tourist here is on the rise. They will take your top brand Nike shoes if the opportunity is there for them. Young youths on the streets at night are only a problem in Lima. Elsewhere in Peru you see signs ‘protect the tourist’ and plenty of police keeping watch. The bus system in Peru is good, just the roads are hard work, but don’t hesitate to take them. It’s not as scary as it seems really. Sad but true is also the fact that you will see men urinating in the street. If your urgently need to go the toilet just ask in a shop or restaurant. Sometimes it may require you to buy a cup of tea or coffee. As in most South American countries have some toilet paper on you all the time. At public places like bus stops you have to pay to use the toilet. I don’t mind this as they are only trying to make a living. Take the backpackers train to Machu Picchu. I found it interesting with amazing scenery and of course there are those switchbacks. This train ride also gives you lots of photo opportunities and a chance to meet people from all over the world. Enjoy Peru and take your time, there’s a load to see.